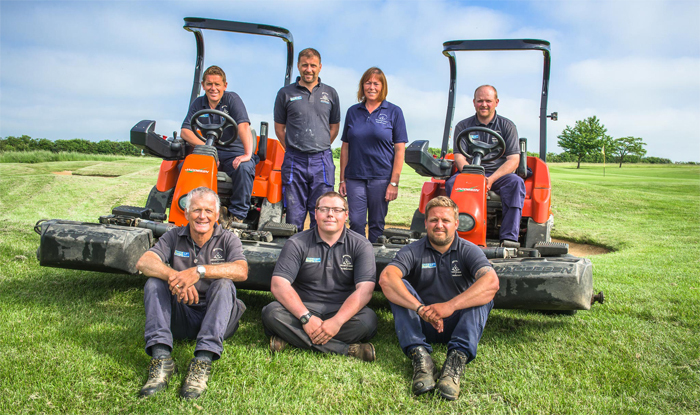 Our greenkeeping team at Kirtlington is one of the best in the country. For example, Brett Moggridge (our versatile, long-serving Nick Knowles-like Course Manager) and Steve Hirons(our Deputy Head Greenkeeper with the film star looks) have three times been selected by the European Tour to work at Wentworth as part of the BMW PGA Championship course management team. All 27 greens scarified (-5), verti drained, solid tined and ironed..
Overseeding time for some of fairways worst hit last Summer! !